Report on Indian E-logistics Industry. Currently, leading players like FK and AZ deliver 80-85% shipments through captive arms. 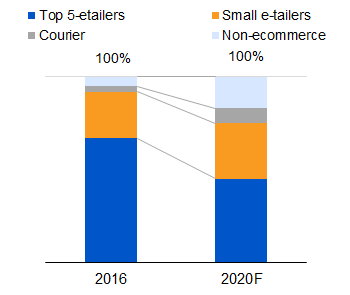 Unlike the big-etailers, smaller e-tailers do not create large business opportunities for 3PLs. Courier/documents business has become lucrative for new age 3PLs due to higher margins associated. While non-ecommerce shipments (like offline B2B) would be playing a critical role for the 3PLs going forward.